Ya tenemos la Beta, ya muchos de nosotros la hemos instalado y estamos jugando con ella, pero qué cambios trae DSM 5.0 en esta primera build liberada? Lo primero de todo decir que DSM 5.0 solo está soportado por todas las series x10 en adelante y que los paquetes osCommerce, vTigerCRM, OpenERP 6.1, Zarafa, DVBLink y Polkast no son compatibles todavía, si usas alguno de estos programas en tu NAS no actualices. Widgets page allows you to monitor the NAS status with all widgets in one page. All widgets can be minimized as a tray icon. Multiple versions now support differential blocks between file versions to keep file history with better storage efficiency. Files over 8GB cannot be backed up. 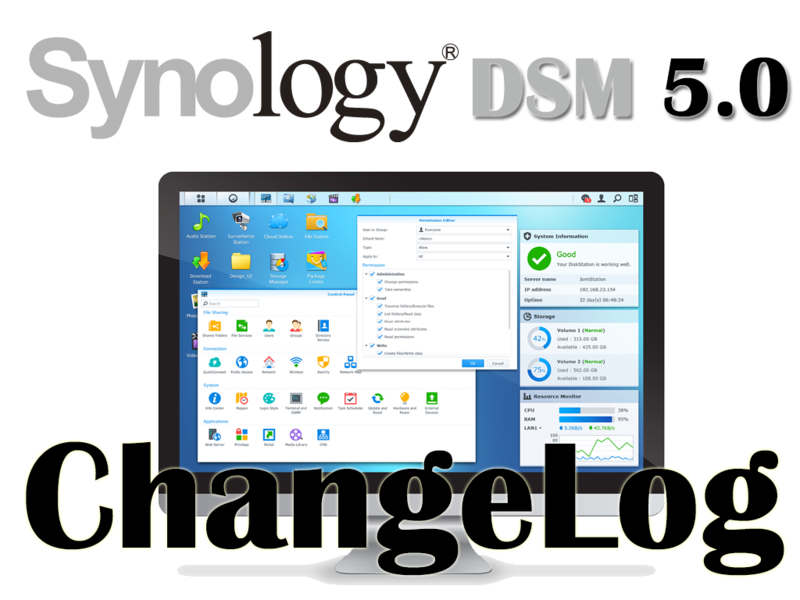 This feature is only supported when backing up to the same Synology NAS or another Synology NAS. Disk health information includes the current and historical health of hard disks. SSD read-write cache is supported on XS and XS+ Synology NAS models. Two identical SSDs can be combined to create a RAID 1 cache and enhance the performance of a volume or Block-level iSCSI LUN. To ensure data integrity, you have to remove SSD cache in Storage Manager to flush data into drives, before physically removing the SSDs from Synology NAS. It is not supported to create a High Availability Cluster with SSD read-write cache enabled. File sharing links can be created for your Google+ and Facebook friends. Those who receive the link will be asked to enter their Google+ or Facebook login credentials before accessing the folder or file. The “http” group (http) is introduced to be the service account of Web Station for better flexibility and security. Web applications will run as the same permission as “http” group. We suggest you to review the permission of the web folder and assign appropriate permissions to http group. Updated to PHP 5.5. Please check the compatibility of your PHP-based web apps with php 5.5. Leaping performance enhancement by the new Apache MPM worker. The default indexed folders - photo, video, audio are removable from indexed folders. When bounding two or more ethernet connections to create an aggregated heartbeat connection, load balancing and failover are supported, and the data synchronisation throughput can be improved up to 50%. - Monitor the health and availability of managed servers. - Receive system notifications from managed servers. - Create server groups and define policies in order to apply settings to entire server groups. - Keep each server in your fleet up-to-date by performing software updates. - Delegate administrator permissions to specific users or groups, allowing each admin to manage specific servers or server groups. Clustered storage system aggregates storage and computational resources of multiple Synology NAS servers. Each Synology NAS server can be designated as a Storage Server (expands storage capacity) or a Computing Server (increases throughput). Scale-on-demand architecture lets you expand storage capability linearly by adding more storage servers to the cluster. Namespace is unified across different computing servers. All computing servers can share the same NetBIOS name for load balancing, as well as rotate a unified IP address for failover. Storage servers support 1-replica and 2-replica configurations for data redundancy. Unused hard drives on the storage servers can be combined into RAID 5/6 configuration to provide storage capacity for the cluster. All of the servers must be located in the same subnet and the same Domain or LDAP environment. You can add up to 12 computing servers and 12 storage servers for a maximum of 1 petabyte of storage space. Available on XS+ and XS series. Synology High Availability is not compatible with Storage and Computing Server. Synology NAS in cluster mode does not support disk hibernation. Overview page allows you to easily install Cloud Station client software on different devices. Version history allows you to easily navigate and locate the deleted or previous versions of files. Historical versions of files can be restored from version history. Sync permissions of users can be changed to read-only; in this case, users cannot upload new files or modified files with Cloud Station Client. Certificate verification supports SSL connections. Cloud Station Client on DSM allows your Synology NAS to sync folders and files with another Synology NAS running Cloud Station. Sync can be performed with multiple Synology NAS servers. Previous file versions can be directly downloaded. You can create file sharing link in Windows File Explorer and Mac Finder. Files can be synced from Google Drive, Dropbox, and Baidu Cloud. You can enable the tree view of albums on the left panel from the settings to move and copy albums and photos by dragging and dropping. You can to specify file extensions not to generate thumbnails and be displayed, thus avoiding duplicate thumbnails. You can disable thumbnail generation or video conversion for each album in the first level of Photo Station. Settings are applied to subfolders. Sharing videos to YouTube is available. The photos and videos stored in the first level of Photo Station can be set as public. The default value is private. You can select a DLNA player or Apple TV before video playback. You can set the image files stored in the same folder of videos as the poster. This setting can only be applied to “Movie” and “Others” video types. You can enable AC3 passthrough on Apple TV for better audio quality. You can repeat one video or an entire collection of videos. Subtitle display is supported for video playback with VLC plugin in full-screen mode. Transcoding of DTV live streaming is supported in Video Station player. Options to adjust transcoded qualities are available when streaming to Apple TV. Custom libraries and administrators' collection in Video Station can be integrated into Media Server library. MariaDB has replaced MySQL and become a standalone package. Max camera number has been increased to 35 for DS2413+, DS1813+, DS1513+, RS2414(RP)+, RS814(RP)+. Downloads take place in the background and can be reordered. - Files and folders can now be shared with users without DSM accounts. - Advanced search options are now available in addition to local folder search by keyword filtering. - Supports compress/extract files as in File Station. - Folders can be added to “Favourites” like in File Station. Manually uploading photos/videos has been simplified. The channel is displayed when streaming Live TV. Hola, tiene muy buena pinta,¿ Si actualizo pierdo toda la configuración? Por ejemplo el transmission?? Sí que hay un problema con la versión actual de Plex, por ejemplo, pero se podría corregir modificando unas líneas con un script. Es abrumadora la lista de mejoras, pero lo que más me alegra saber es que no se han olvidado de la serie x10. Respecto a actualizar a la nueva versión, recordad que estamos ante una versión beta y pueden surgir problemas. Muchos paquetes funcionarán bien, pero otros tendrán que esperar a la correspondiente actualización. Mucho cuidado si tenemos algo crítico, ya que es una faena volver a una versión anterior. De todos modos, por mi experiencia puedo decir que las beta del DSM son muy estables, y en todo caso en uno o dos meses tendremos la versión definitiva. Sabes si Couchpotato, SABnzb y Sickbeard funcionan bien? hola yo tengo la version nueva pero no me aparece en el panel para modificar los tipos de raid.